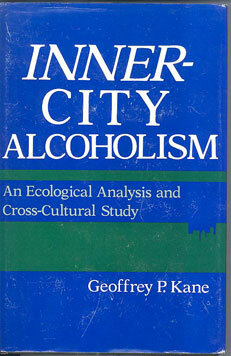 Inner-City Alcoholism, published in 1981, was praised for clarity and scholarship. The core of the book is a descriptive study of 372 black and Hispanic men and women in the South Bronx who sought help for alcohol problems at the storefront addiction treatment facility where the author worked from 1974 to 1978. The book begins with an exhaustive literature review and analysis of the causation of alcoholism and the “alcoholism as a disease” controversy. The book ends with an additional literature review and discussions of treatment planning and evaluation when resources are limited and community approaches to prevention. Geoffrey Kane’s first three chapters are much more than a mere review of relevant terms and concepts. They comprise a philosophical treatise, an epistemological critique of what the finest minds have brought to the alcoholism field over the last half century. Kane deftly, respectfully, exposes this one’s oversight, that one’s academic limitations, the datedness of older hypotheses uninformed by new and unexpected data. He does not shrink from such herculean tasks as considering the composition of “disease,” characteristics of the “medical model,” or criteria for “alcoholism.” Such pluck is unexpected in one able to discourse so cogently on the philosophy of science! For reviewer comments, click here. Even though this book was written more than thirty years ago, its analysis of the controversy surrounding alcoholism as a disease–and now addiction as a disease–is no less relevant today. Download Chapters 2 and 3 and see if you agree. Inner-City Alcoholism is currently out of print. Used copies may be available on Amazon.com or elsewhere. A print-on-demand version may be available in late 2014.